In the last week, I’ve gone on a Connections binge because I finally realized how important this platform is — something I’ve never done on any other social network. I already jettisoned my original Facebook account and access it only via browser (and not via mobile app because I don’t trust it on my smart devices). Google+ is nice for the occasional hangout and for cross-posting, but it strikes me as largely uninhabited (despite its recent, somewhat gamed, rise in the rankings). I certainly don’t live there. Twitter is fine for news syndication, events and conversation, but I sometimes find it more noisy than valuable. I use my micro four thirds camera more than I use the one on my smartphone. Now obviously as you can tell from the adulatory e-mail I received today (pictured above), LinkedIn is celebrating its 200 millionth member, and apparently I’ve climbed out of the sludge of the 99% and become the equivalent of a social media plutocrat (let’s see 1% of 200,000,000 is…). Given that my profile has been viewed a whopping 311 times between today and November 14 2012, it has me wondering whether this accomplishment is as meaningless as LinkedIn’s watered down endorsement feature. But some of my connections are already posting their respective badges (“top 5% most viewed,” “first 500,000 members”) so it’s clear LinkedIn’s “Everyone gets a medal” approach is generating some engagement. And it’s doing well financially, with blockbuster earnings recently, tripling the value of its stock since its IPO. Take that Facbook and your 1 billion members. So why do I still like LinkedIn, despite the empty self-promotional platitudes? (1) I can tell it’s useful to me because I actually do use its mobile app on my smart devices, and consult it daily. Not to stalk my connections, but to see what they’re posting that may be relevant to me as a professional. That’s because, increasingly, LinkedIn is becoming a publishing platform. I’m using it as I would a Zite or Flipboard. If you don’t have one already, I urge you to include a LinkedIn icon on your site. (2) It really is a good place to connect to people professionally, whether directly or via a group. Compared to Facebook, I’m not worried about what I post to LinkedIn — the contextual boundaries are clear. (3) When I do a vanity Google search for my name (I’m convinced that I’m the only “Hanson Hosein” on the planet), my LinkedIn profile shows up at the top of the page. (4) Now that I have a premium account, I can usually identify who’s looking at my profile. This person could be a potential contact, or applicant to my graduate program worth cultivating. It must be said that the sands continue to shift for social networks. As I prepare to host IN-NW again this week, I recall declaring last year how Pinterest was the hottest social network. And at the time, it was. But even as that company seeks a rich valuation, even with its ZERO revenues, I wonder whether it has maintained that buzz in these fickle times. 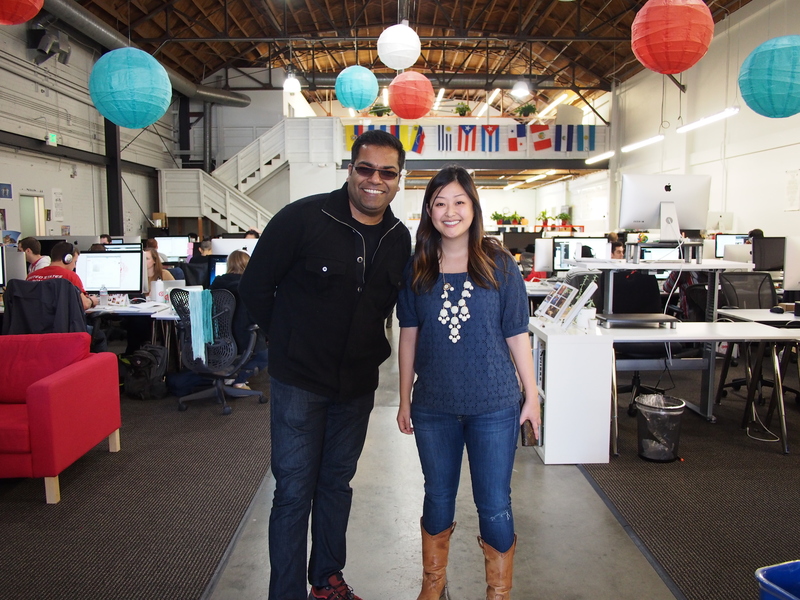 I recently visited Pinterest in San Francisco, thanks to my former student Annie Lee, who works there. She impressed me with the company’s focus and stated community-building mission (which I read as something akin to connecting online, to accomplish things offline). And they’re certainly growing in size and staff. But although I admire Pinterest, and have loaded its nicely designed app, I never use it. That’s too bad because unlike the buttoned-up business-only LinkedIn, Pinterest sure looks like a lot more fun. Ultimately, this could all just be testimony to my headspace these days. 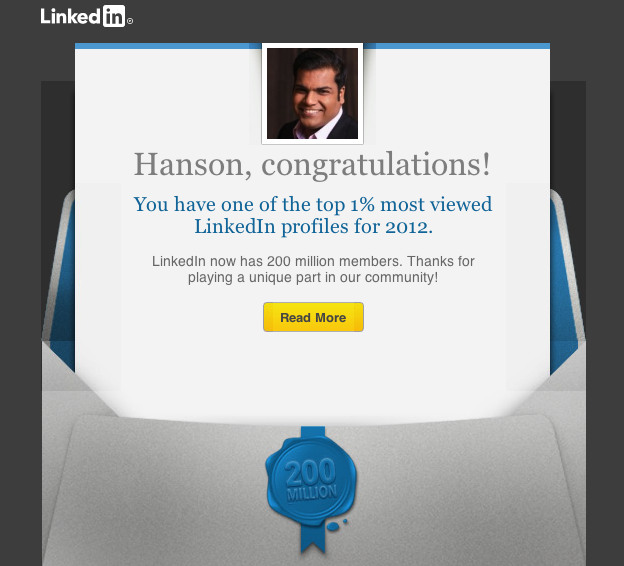 All work and no play makes Jack a dull 1%’er on LinkedIn. The future’s so bright at Pinterest in San Francisco, I gotta wear shades. With Annie Lee. Good points, Hanson. I agree about the use of LinkedIn as a publishing platform. I’ve found that the weekly news roundup email that LinkedIn sends me is the best aggregation/curation of content that applies to my field and my career (and thankfully, cuts through all of the Mashable-like noise).